Sun Luck was located at 143 West 49th Street, near the Radio City Music Hall and Berlin’s music company. 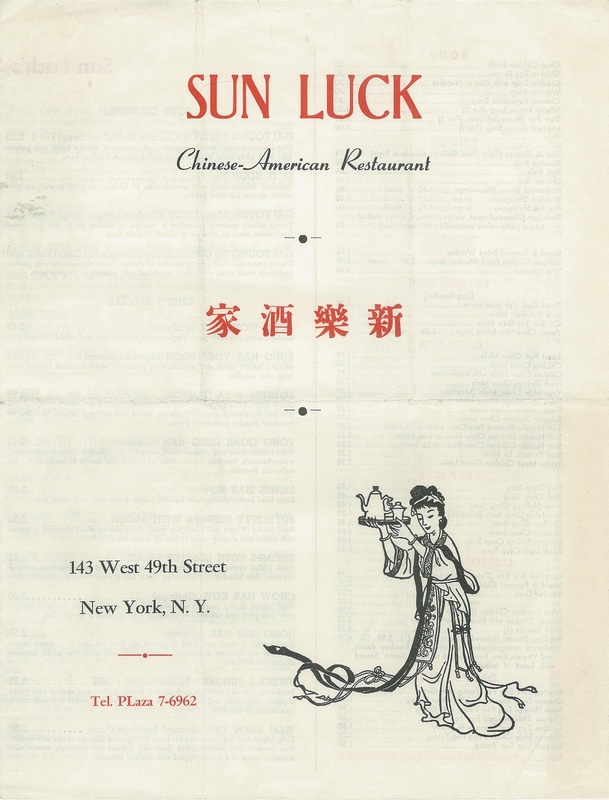 (A sister restaurant named Sun Luck East was situated at 75 East 55th Street.) 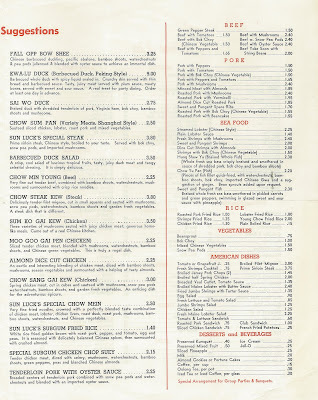 In addition to its convenience, Sun Luck offered a variety of Chinese cuisines. 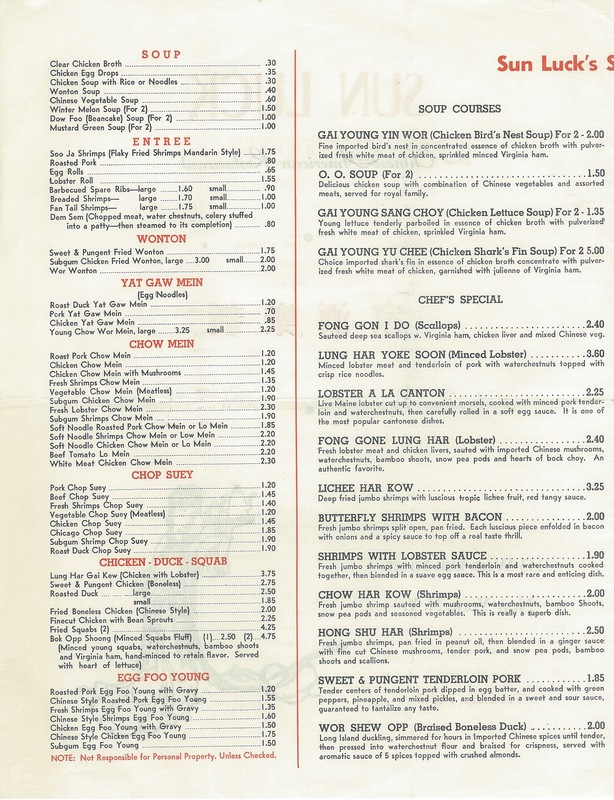 Owner Jack Yee worked as a chef in Shanghai, Hong Kong, and Guangzhou before immigrating to the United States.2 In addition to typical Chinese-American dishes like Chop Suey and Chow Mein, Sun Luck offered specialties from four regions, making it one of the first Chinese restaurants in the country to emerge from the doldrums where they had languished for decades. 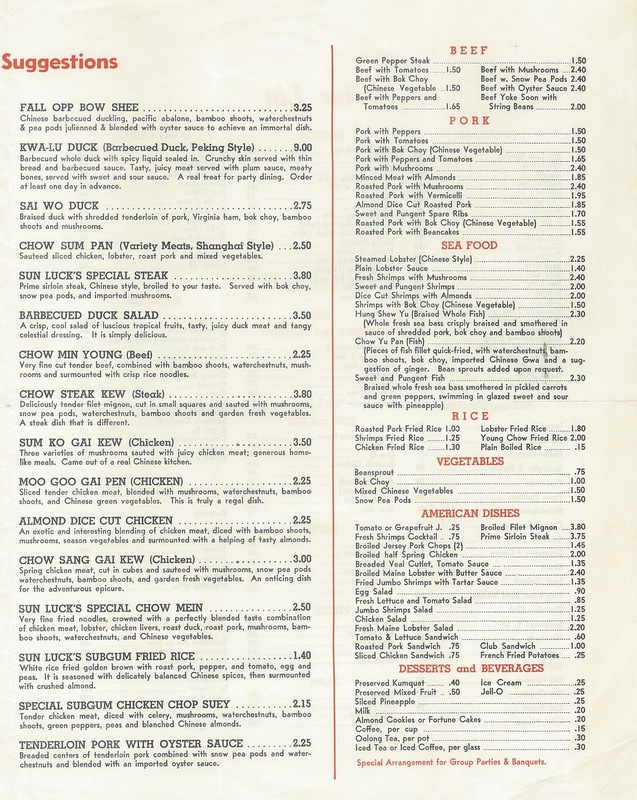 “The fact that New Yorkers are becoming interested in Chinese dishes other than sweet and sour spareribs is a welcome sign that their gastronomical interests are widening,” reported food critic Craig Claiborne in 1956. “Feeding their new curiosity concerning the less familiar aspects of Chinese cooking is an exciting restaurant, Sun Luck…This large establishment, seating almost 300 guests, lists the specialties of Canton, which are already known to many here, plus the less well-known dishes of Peiping, Chungking, and Shanghai.”3 One of the dishes that Claiborne recommended was Soo Ja Shrimp—flaky, fried shrimp prepared in the “Mandarin” style, a term then applied to any Northern, non-Cantonese dish. One specialty called O. O. 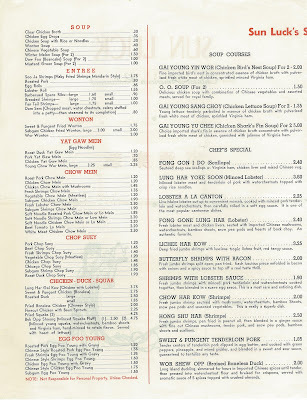 Soup was touted as having been served to “the royal family,” presumably the Queen Mother who visited New York in 1954. 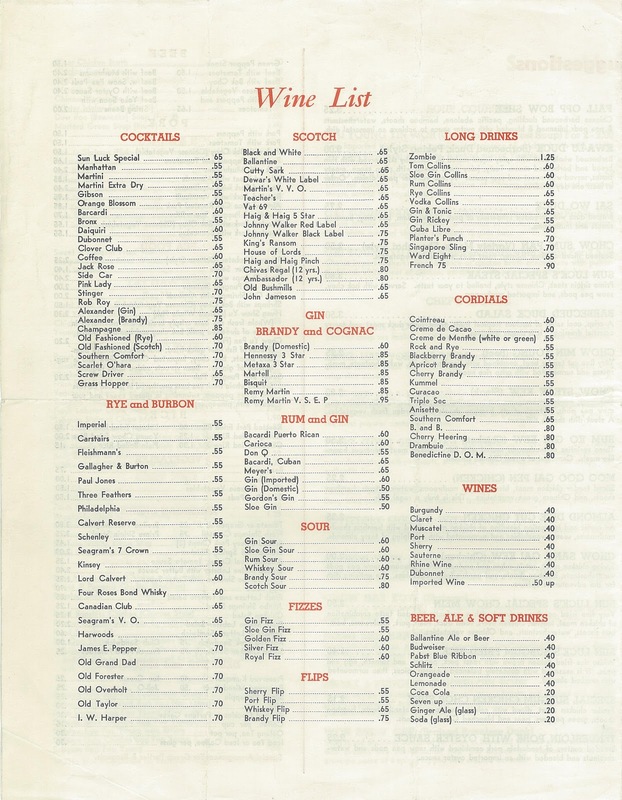 In addition to its regular menu below, Sun Luck maintained a booklet with more than 500 dishes that were also available. 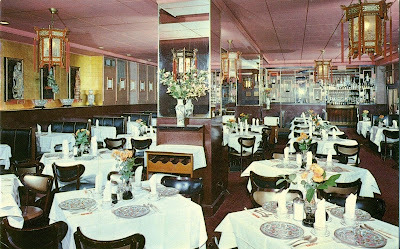 Sun Luck opened its seventh location near Times Square in 1969, making it the largest Chinese restaurant chain on the East Coast, if not the country.4 Even though Claiborne reported that the new place came off “surprisingly well,” the cycle of decline was soon evident.5 By the time Sun Luck ceased operations in the mid-1970s, innovative restaurants like Shun Lee Palace and Hunan were taking Chinese-American cuisine to the next level. Berlin may have come to appreciate Chinese food while working as a singing waiter in Chinatown in 1906. Chinese immigration, much like the Jewish experience, was often marked by struggle, progress, setbacks, discrimination, assimilation, and success. Indeed, restaurateur Jack Yee and composer Irving Berlin were both success stories, each using his talent to enrich, and even define, the American cultural experience. After all, what could be more American than inventive Chinese food and the songs of Irving Berlin? 1. New York Times, 23 December 2005. 2. Jack Yee previously worked as a chef at the Golden-Gate restaurant in Shanghai, the Capitol in Hong Kong, and the Diamond in Guangzhou. 3. New York Times, 31 October 1956. 4. 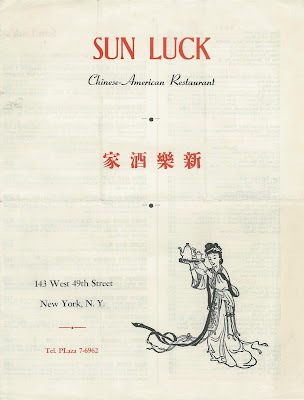 Sun Luck locations included Times Square (200 West 44th St.), the Imperial (965 Lexington Avenue at 69th St.), Sun Luck East (75 East 55th St.), “Gourmet” (157 West 49th St.), Flushing (144-08 Northern Blvd., Queens), Elmhurst (91-16 59th Ave., Queens), and Sunnyside (45-12 Queens Blvd., Queens). 5. New York Times, 31 October 1969. 6. New York Times, 18 June 1972, 4 July 1972, 22 May 1973, 15 October 1974.